Specially Designed for two overlay top running shutters. Fit the top track support behind the top track and to the inner side face of the cabinet as shown in Fig 2. 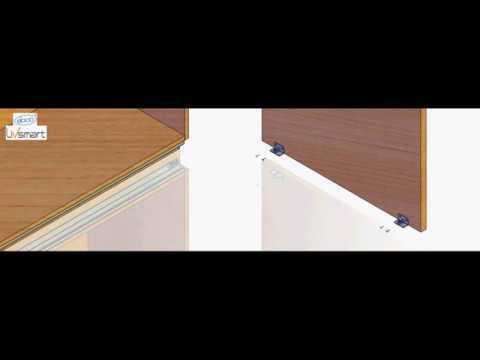 Fit the bottom track to the bottom face of the cabinet as shown in Fig 3. (for dimensions refer Fig.1). Fit the top hanger outer to the inner face of the outer shutter and top hanger inner to the inner face of the inner shutter as shown in Fig.1. Fit the bottom guide outer to the inner face of the outer shutter and bottom guide inner to the inner face of the inner shutter as shown in Fig.1. Fit the soft close assembly as shown in Fig.4. Fit the bottom stoppers as shown in Fig.5. (use 8mm wodden packing for inner shutter). Hang the shutters to the top track and lock the shutters as shown in Fig.6.